After finishing 3:16:51 at the Philadelphia Marathon in 2017, I was poised to do more “fast runs” in my training. When I met Meb at the NYC Half expo in 2017, I asked him, “What is the most important training for a 3:15-3:20 guy to try to break 3:00.” His immediate answer was “long tempo runs!” So, one thing I changed in my training schedule was to join the Local Competitive Group runs on Saturdays. We usually meet at the BP gas station by Kent Avenue/Williamsburg Street West around 8-8:30am and run for 10-15 miles. The pace depends on who joins on any given day, but is usually between 6:30-7:30/mile. It was bit intimidating at beginning, as 6:30/mile is pretty much my hard race pace. But my basic approach was: “If you want to race like LC guys, you need to train like LC guys” and this was perfect for the “Long Tempo Runs” I needed. After 6-8 Saturdays in January and February, my plan was going well leading up to the NYC Half Marathon in mid March. I not only crossed the 10K mark 10 seconds faster than my PR (ok, it is mostly downhill to Manhattan Bridge from GAP…) and I came to finish within 30 seconds of my half marathon PR I set in the 2017 Brooklyn Half. The NYC Half Marathon course is lot harder as you need to tackle Central Park Cat hill & West Side rolling hills at the last 3-4 miles, whereas the Brooklyn Half you do hills at the beginning and it ends with a long downhill for the last 6 miles. I had registered for the Rotterdam Marathon for mid April, which is a pancake flat course (Kipchoge had won in 2014 with 2:05) and I was feeling confident of shaving some serious minutes off 3:16. However, a few days after the NYC Half, disaster hits me. I was walking my dog and slipped and fell in such strange way that overstretched my left ankle. I never felt that kind of sharp pain that so at first I thought I broke my ankle! Long story short, I couldn’t run for 3 months, missing not only Rotterdam, but important club point races like the Brooklyn Half Marathon & the Healthy Kidney 10K. Just few days before the Queens 10K in June, I started jogging lightly and “jogged” in Queens 10K race. In the 3 months that I couldn’t run between March and June, I was really frustrated, as with any injury, you really don’t know how soon you can resume running. I tried to be positive as I had more time to do core and upper body training. I always thought I am built “too light” and strength training could benefit my running. I also resumed LC Saturday runs in July and, again, that built lot of confidence leading to the Bronx 10 Miles and Staten Island Half Marathon. In the Bronx 10 Miles, I improved my previous year’s PR by 50 seconds. I shaved 45 seconds off my 2017 Brooklyn Half Marathon record for a 1:26:09 in the Staten Island Half. I was feeling confident of improving my PR in the New York City Marathon, but in any Marathon, pacing is the key to success. I was debating within myself how fast I should go on first 10 miles. 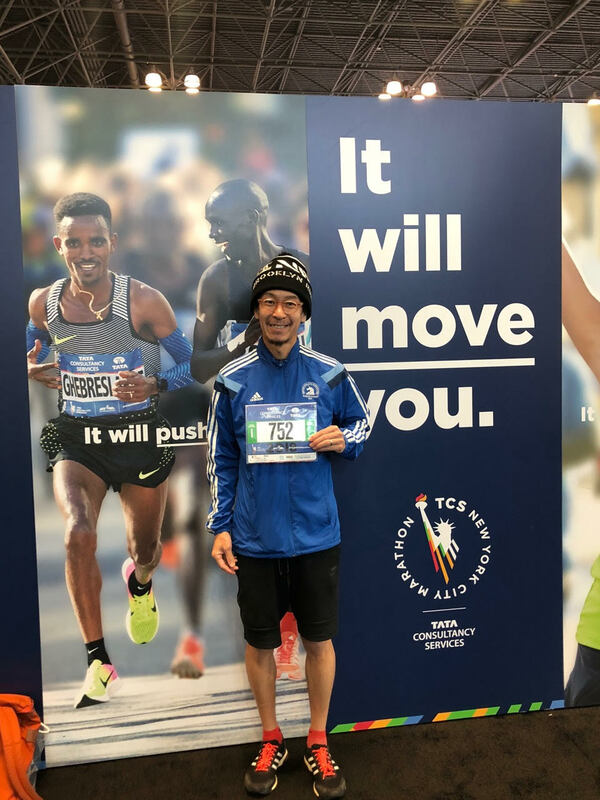 If I go too fast, it might end in disaster but if I go too conservative, I won’t achieve good result… Huge dilemma… I thought I am not quite ready to go sub 3 (at least in the NYCM course), so I set my target to somewhere around 3:05:00. In the meantime, the NBR G-Masters [Grand Masters] group were in a quest for podium finish in annual standing. We had 2 key injury drop outs in Bronx 10 Miles and also facing only two participants (Gregg Baldinger & myself) in NYCM, which meant “no points” in that race. Only at the last minute before the race, we recruited a new member and we went to the race with 3 participants. This meant, I couldn’t afford an “all or nothing” race strategy. I not only wanted good results for myself, but also for the team. Gregg and I discussed very similar strategy of starting first 10 miles at 7:00/mile pace and see how we are feeling. From all prediction apps (based on training mileage, pace and recent race time), my realistic goal was somewhere between 3:05-3:09. Mile 1: 8:27 (Uphill on the Verazzano Bridge and no warm up.) It’s really hard to properly warm up in these large event as we are escorted to corrals in the way that there is no space to move around (this is something I need to remember for future). I wasn’t sure if my GPS was working properly, so I paid no attention to first mile pace. Mile 2: 6:31 (Downhill on Bridge) Wasn’t really sure if it was GPS fail or actual pace. So, no attention paid here either. I just didn’t want to trip and fall on the downhill and some uneven ground and some discarded layers of clothing. Mile 6: 6:51 Through the street of Bay Ridge, Sunset Park to Downtown Brooklyn, I spotted several of my friends and so far, the pace was good and I was feeling comfortable. Just paying close attention to be in good rhythm. The weather was perfect with no wind and good temperature. Mile 8: 6:56 Received my first Maurten from Seth. Thank you, Seth!! Mile 12: 6:58 Best feeling seeing all my team mates @ mile 12 water table! Thank you for cup of water, Zoe!! Mile 13: 6:55 Going up and down on Pulaski Bridge, I started feeling bit of discomfort in my ankle. Mile 15: 7:16 Queensborough Bridge. Didn’t hit my mile pace target, but still not panicked. I kept myself composed. Mile 25: 7:45 Getting inside of Central Park, I started feeling cramp in my calf and thighs and couldn’t keep the pace in fear of cramp “popping” to end my race. I had to be cautious. Mile 26: 7:45 Last climb from Columbus Circle to finish line, I saw Gregg passing me and shouting to finish strong. Thank you Gregg for last push. Finish: I finished in 3:07:44, 5 seconds behind Gregg. Thank you, Gregg for pacing (each other), pushing (each other) and encouraging (each other)!! We will repeat duel next year! It’s about a 9 minute PR and I was happy to achieve the 3 hours and single digit I was aiming for, but I also wanted to go little faster. My first reflection was that from mile 23, I started losing strength and started cramping. It could have been over pace in the beginning, up and down on multiple bridges, or other reasons, but I pledge to work more on my strength training (i.e core, lunges, squats, calf raises etc). My other reflection is that, because I had to skip Spring Marathon in 2018, I had bit of anxiety over 26.2 mile pace management. I will also keep on doing Saturdays LC runs and try to keep up with lead group, aiming for a sub3 race in Spring 2019 Marathon! Last but not least, I wanted to thank all people that support not only this wonderful event, but also running in general, my team mates, volunteers and my family. Also, thanking God, I am healthy enough to challenge 26.2 miles of adventures we all love!